Join us in luxurious comfort aboard the M/V Experience One in Ketchikan and start your Alaska fishing adventure out right! This is your one stop in Ketchikan for halibut and salmon fishing charters, sightseeing, and Alaskan eco tours. We offer Five Star fishing charters at affordable prices. Alaskan Eco Tours to view and photograph Sea Lions, Killer Whales (Orcas), Bald Eagles, and more! On a cruise ship and want to go fishing, see some wildlife or both? Maybe you are going to visit Ketchikan and want to go all day? 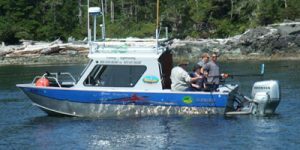 Exclusive charters for extended families or small groups with room for up to 23 individuals for wildlife viewing and harbor tours. Salmon, halibut and rockfish fishing up to 6 individual seats on any given exclusive charter. NOTE: Southeast Alaska fishing regulations only allow 6 lines in the water at any given time. The Nika Lynn for charters to accommodate 1 to 4 people. 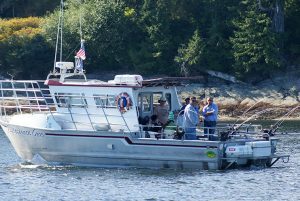 The Hewescraft vessels are known throughout Southeast Alaska for comfortable ride, stability, safety and efficiency. 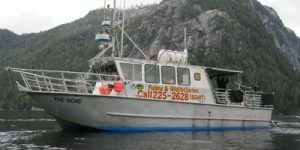 This vessel is the best choice for individuals and small groups trying to book salmon or halibut charters. Everyone that fishes has a pole in the water. That’s what we do! Most importantly, we want to have best time ever in bringing home your little piece of Alaska. Don’t worry; we meet you right at where you get off your cruise ship! We offer a free complimentary day charter for a catch and release of an unharmed halibut over 100lbs. (after a photo of course). The big fish are females and the best breeding stock, producing the most eggs. This practice helps protect this resource. The smaller fish are far better eating, and you can come out again to catch another limit, space available. We have our own vessel as well us other vessels and captains we feel comfortable with. Safety, Comfort, and having a great time are most important to us, so we are particular about whom we do business with.